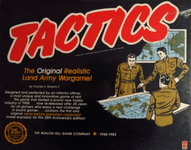 TACTICS is the very first modern board wargame...designed and perfected by Charles S. Roberts II, founder of Avalon Hill and pioneer in the design of tactical all-skill games of logic. In 1952 while an infantry officer, Charles S. Roberts designed TACTICS for his own tactical and strategic instruction, primarily to test application of the nine Principles of War in preparation for a military career. Two mapboards were prepared to provide a variety of terrain situations. The first never before published version is in the 25th Anniversary edition. The second mapboard, with rules similar to those contained in this game, was copyrighted in an edition of only 2000 copies in 1954 by the Avalon Game Company. TACTICS became TACTICS II, a game as popular today as when it was published under the new Avalon Hill Game Company back in 1958. TACTICS II is the top selling wargame in history, And it is the progenitor of the "Charles S. Roberts Award" presented annually by the hobby industry to outstanding contributors to the wargaming avocation. In TACTICS your strategy alone determines the outcome of every game. There are no chance cards, spinners, or random luck elements. No military experience is necessary-but you'll certainly learn what it's all about after playing just one or two games. All you really need , now, is a little common sense and-who knows-you may find you have what it takes to run a war. TACTICS could be called "Military Chess." The chess pieces in this game represent military units such as infantry, armored, parachute and amphibious divisions. TACTICS is basically a battle between two complete armies; each person begins with equal forces occupying one-half of the realistic looking mapboard. Players maneuver their divisions across a 22" x 28" mapboard portraying a fictional continent with a great variety of terrain including railroads, woods, mountains, rivers, beaches and cities. Obviously terrain affects both movement and combat in a variety of ways. It is in the shrewd deployment of divisions, combined with a bit of foresight and logic, that makes this game FUN TO PLAY time and time again. A whole generation of wargame hobbyists cut their teeth on this game system. For the person who has never experienced the thrill of wargaming, TACTICS is a great starter game. For those already familiar with the hobby, with TACTICS you get a never-before-published mapboard in a brand new game that's over 25 years old.